John’s wife heard some strange noise, characteristic of rodents’ gnawing in the bedroom. She got a stick and tiptoed into the room, quietly lifted the hanging blanket and exposed the largest rodent she had ever seen. Underneath the bed, John was helping himself to meat which he had picked from the boiling pot in the kitchen. When I visited my cousin, he bought local brew and I sat, relaxed and forgot about the stressful life in the city. Out of no where, I heard an angry voice in the backyard. The little girl who had been entrusted with cooking the chicken had been caught helping herself to some of it. I have read several stealing-related stories in the media prints. In one (New Vision), Kiconco, a goat thief, was photographed with three goats – a skinned one carried around his neck and the other two held by hand. 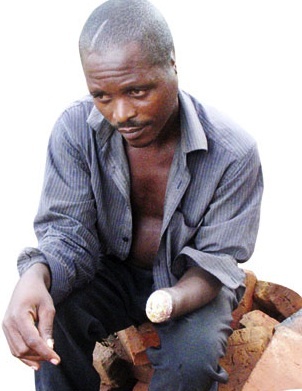 In another (Daily Monitor), the same knife, Munizera, used to skin stolen goats was used to chop off both his left hand and ear. Many similar culprits have not lived to tell their stories. I have also read about the professional robbers who either waylay or attack people and institutions even during day time. It is amusing when civil servants make the remark, ‘essente zange zegatta nezagavamenti’ (my money got mixed up with that of the government). This happens when they are found to have had some financial mishaps, and got interdicted. Their defence to the ‘ignorant’ relatives and friends is that somehow, their money got entangled with the government’s money. During the process of disentangling the two ‘moneys’, they accidentally rewarded themselves more than their true share. Luckily for most of them, the charge is often not ‘theft’ but ‘embezzlement’ – which literally means misappropriation of funds. The above characters have one common theme – theft. John and the little girl are domestic-oriented, Kiconco and Munizera are locality-oriented, robbers are regional/national-oriented, while ‘Essente…’ is institutional-oriented. However, there is a distinct difference in the prosecution process and the proportionality of punishment. John, the head of the household effectively steals his own food. The act sets a bad example, particularly for his children. No one can physically punish John. The best punishment is psychological embarrassment – achieved by spreading the story. The little girl is a familiar story. Many of us did it in different ways when we were young, got away sometimes but got caught and punished other times. In this case, I can envisage the little girl imagining (probably based on past experience) having no share of that chicken once it gets to the visitor’s table. So the temptation is quite strong especially when such a delicacy is served only once in a while. At times, the punishment gets out of hand, particularly when the child isn’t an own child. You have heard of step-mothers burning their step-children’s hands – the very people who deny the children certain foods, thereby inducing temptation. Children need constant reminding of what is good and bad. An occasional corrective punishment is allowed, but it should be proportionate. Under no circumstance should it inflict physical damage to the child’s body, which would be a crime in itself. Kiconco and Munizera are direct thieves and potential murderers. People, particularly the ‘typical villagers’ pass through many hurdles to own a goat. Some start off with eggs, then chicks, then chicken and finally a goat. That goat may be their only multi-year investment. Kiconco and Munizera are capable of killing anyone (including the goat owner) who interferes during the theft act. Nonetheless, individuals set a bad precedence when they arrest, prosecute, judge and punish the suspects. They should simply arrest (roughen them up a bit without inflicting physical injuries), and hand them to the police. The professional robbers have by their acts signed individual death warrants. They often operate in gangs and some are armed to machine-gun level. They will kill anyone who comes in their way. I don’t sympathise with them when the police pursue a shoot to kill policy – otherwise they themselves can be killed. Essentes are the silent, and yet the most dangerous murderers. The pen is their weapon! We are talking about millions, or tens of millions, often hundreds of millions, and very occasionally billions. By stealing so much, they deny the rest of wanaichi access to proper medical care, education, defence, etc. Their acts are costing the country many lives per year. Essentes should be a top agenda item for the new Minister for Ethics and Integrity. Punishment should go as far as confiscating all their assets, in addition to significantly long custodial imprisonment – long enough to ensure that they don’t benefit from any hidden assets after serving the sentence. A judge ordered two convicted shoplifters to carry these signs in front of an Alabama Walmart.